McGill’s motto proudly states “by work, all things increase and grow” (Grandescunt aucta labore). We believe that changing the way we work can help us increase knowledge and grow the movement towards sustainability. The Sustainable Workplace Certification program challenges staff and students throughout the University to foster healthier, more environmentally-friendly, and connected workplaces through individual and collective practices. The "green" certification uses teamwork to achieve 4 increasing levels: Bronze, Silver, Gold, and Platinum. Each level has about 15 actions and 1 bonus initiative. 75% of the designated team must commit to doing all points to get certification. After the workplace/office designates individual(s) to lead the certification process, shona.watt [at] mcgill.ca (contact the Office of Sustainability) for certification documents. The office will then determine the scope of the team, identify key stakeholders, and come up with a vision and goals that will help you achieve your desired level. Once the process is complete, certification is valid for two years. For a more comprehensive view of each level, read the certification checklist! Use your creativity in a fun way! Who counts as my “team”? Your team can be as large or small as you think is appropriate. The team leader will be responsible for presenting information to the team, coordinating the efforts, and liaising with the Office of Sustainability to submit documentation. In some cases, having a large team may be hard to motivate or communicate with. Some teams may be entire units, while other teams may be certain floor(s) of a building. Your team can include staff, faculty, and students. I can’t get 75% of my colleagues to sign on to the actions. What should I do? If some of your team members seem unable or unwilling to commit to the actions, there may be several approaches. First, it is important to approach the stakeholders (anyone who will be impacted by this) to see what their point of view is. Perhaps they are too busy, uninterested, concerned that it will negatively impact their work, or unaware of the program. Taking the time to speak with them in a team setting or as individuals can help you understand their concerns and adapt the approach accordingly. Joining the Staff Sustainability Network and meeting with the Sustainability Programs Coordinator can also help get ideas on how to increase participation in the initiative. To learn more, email shona.watt [at] mcgill.ca (Shona Watt). Do I have to go through the certification stages one by one? Yes. The sustainable workplace certification transforms the culture of sustainability in an office by asking individuals to commit to concrete steps in their office. Many of our commitments to become more sustainable tend to fade away in the days after we make them. In order to address this reality, the Sustainable Workplace Certification requires people to go through each certification level one at a time, with a minimum gap of one month between each level. Although your team can start implementing as many actions as possible from the beginning, we want stress the importance of staying realistic, setting achievable goals, and maintaining these actions in the long term. If you encounter challenges after the implementation of your first certification, we encourage you to reorient your efforts to maintaining the commitments you have already made rather than aiming for a higher certification right away. Each certification level is valid for two years, and can be renewed. Each certification level is valid for two years. Since individuals and office operations can change over time, it will be necessary to check that the majority of the team is still committed to doing the actions. Once you have verified the actions with your team, please send the certification renewal form to the Office of Sustainability. Where did these actions come from? The Sustainable Workplace Certification Program was inspired by many other universities which have “green office” certifications, such as University of Toronto, Penn State University, and Yale University. Since sustainability at McGill also includes a strong social component, our certification was expanded to cover ideas relating to environmental, social, and economic sustainability. Our Sustainable Workplace program is aligned with McGill’s three major sustainability goals: our Vision 2020 sustainability strategy, carbon neutrality, and STARS Platinum rating. McGill participates in STARS (Sustainability Tracking, Assessment & Rating System) from the Association for the Advancement of Sustainability in Higher Education (AASHE) to evaluate the institution’s progress. Since collaboration with other units and perspectives is so important to MOOS, we created a small ad-hoc working group to create the actions and the process for the program. Many thanks to Fred Samson (Facilities), Sacha Magder (former SSMU VP Operations & Sustainability), Louise Lockhart (Health Services), Tanja Beck (Office for Students with Disabilities), Maxime Gagnon (Campus Space and Planning), and the Social Equity and Diversity Education Office, as well as the many others who generously gave their time and feedback. Does my team have to meet all the criteria of a level to get certified? A net score of 100% is required, but as you may notice, there is a bonus point available for each level. We encourage everyone to get all their points from the main 15 or 16 criteria but understand that some offices have particular circumstances that prevent them from achieving every criteria. We also encourage you to get in touch with us, so we can try to help you achieve your goal. My team and I think we can achieve the first certification level but want to learn more before we go any further, what should we do? Great! 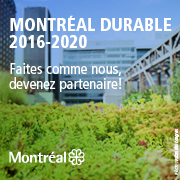 Send us an email at engagement.sustainability [at] mcgill.ca. We’ll have a quick meeting to go over questions you may have and get going with the next steps. What are the promotional opportunities offered by the Sustainable Workplace Certification? At the end of the certification process, we will ask you to send us a photo of your team to put a banner with the certification level you obtained at the bottom. We will also send you the general logo. You can put these on your social media, in your office entrance, on a shared fridge, on your reception desk, or any other ways you like. Check out the Office of Sustainability’s social media platform for examples of team that received the certification in the last months. What are some of the other resources associated with the Sustainable Workplace Certification? We use Yammer (see screenshot below), a platform that somewhat resembles LinkedIn and Facebook. By logging in with your McGill credentials and joining the Sustainable Workplace Certification group, you will be able to see relevant content and interact with other employees interested in sustainability. If you are having trouble joining the group, feel free to send a quick email to engagement.sustainability [at] mcgill.ca. We also host the Sustainability Network Group lunches to bring staff from different departments come together and discuss topics in sustainability with guests that are knowledgeable in the field. This also allows the staff to physically meet with other people like them whose job is not directly linked to sustainability but who are interested in the topic. Which workplaces have been certified?